I made a Handy Ma’am apron to protect my clothes from sawdust, paint, and such when I work in my workshop. Once I realized how nicely an apron kept me clean while DIYing (because, DUH, that’s what aprons do) I started wearing it while crafting too. 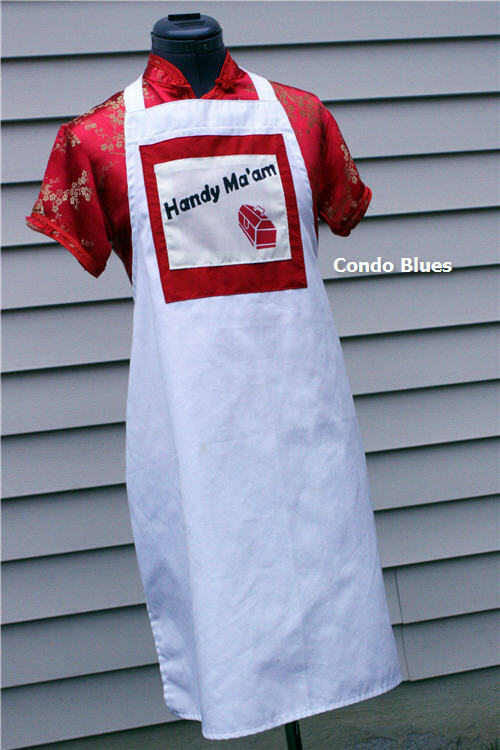 Read my how to make a Handy Ma'am apron tutorial here. Don't fall for Lisa's trick. She's crazy. I had her tested. I took the opportunity to poke through my fabric stash and make a cute craft apron. I didn't have enough printed fabric in my stash to make a one piece butcher’s style apron like my workshop apron. Instead I went with a girly 50’s style apron that I made up as I went along and influenced by the shape and amount of fabric I used. 1. Use the panel pattern to cut three petals from your pretty front fabric and three panels of your lining fabric. 2. Pin the front panels together side by side. 3. Use the sewing machine to sew the front panels together, removing the pins as you sew. 4. Pin the back panels together side by side. 5. Use the sewing machine to sew the back panels together, removing the pins as you sew. 7. Cut two rectangle that is 16 inches wide by 9 inches long for the top of the apron. Cut one rectangle from your pretty front fabric and cut one rectangle from your lining fabric. 8. To add interest to the top of the apron, fold each rectangle in half and cut a small angle from the top center fold of the fabric. This will make the divot in the center of the finished apron. 9. Pin the pretty front top to the pretty front bottom of the apron and sew them together with the sewing machine. Remember to press the seam after your sew it! I’m trying to resist the urge to tell you to sew your top on. Hee! 10. Pin the lining back top to the lining back bottom of the apron and sew them together with the sewing machine. Guess what? You should press this seam after you sew it too. Whoo! 11. Make the top apron straps by cutting 2 front straps from your fabric or ribbon that are 22 inches long by 2 inches wide. 13. Turn each strap/tube right side out so the seam is inside the tube. Press the tube flat with the iron. 14. Top stitch along the sides of each apron strap. This is optional but I think it makes it look more polished and allows the straps to keep their shape when you wash it. 15. Pin each strap right side (the long part) facing in to the top corners of the front of the apron. 17. Sew the front of the apron to the back of the apron leaving a hole in the seam you will use to turn the apron right side out. 18. Turn the apron right side out and press it with the iron. 19. Pin the hole in the seam together and top stitch along the outside edge of the apron to sew the hole closed and keep the lining from acting wonky when you wear the apron. The green and blue arrows in Steps 17 and 19 are to give you an idea of the difference between sewing the front to the lining and top stitching the gap closed with the rest of the apron. Obviously your sewing will be more even and consistent than my wonky arrows. 20. Pin and sew a 2 inch wide by 92 inch long (approximate) ribbon along the front of the apron were the top and bottom of the apron meet. You can make your apron tie as long or short as you want. I went with 92 inches because that is the length of ribbon I had on hand. 21. If you want pockets, cut two 7 inch wide by 8 inch long pieces of fabric (I rounded the edges after I cut mine but you can do what you like), fold over the top of the pocket and sew it to make the top of the pocket. 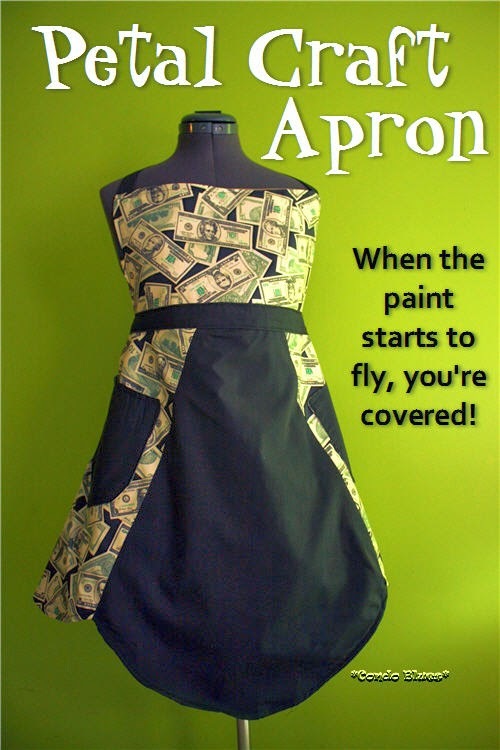 Pin the pockets to the front of the apron and sew them on with the sewing machine. 22. Give the apron one last pressing with the iron and tie one on!